Whether you’re a teacher, parent, school administrator, or homeschooler, you might be interested in taking a look at some of these online resources related to green/environmental education. These websites provide ideas for curriculum, lesson plans, and hands-on activities for teachers and students. Many of these resources are related to K-12 education, but some also apply to higher education. 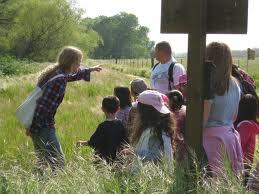 Outdoor education is an important branch of environmental education. The concept of “nature-deficit disorder” is described in the bestselling book Last Child in the Woods. It’s especially important for urban youth, who may never have spent any time outside of their cities, to be given opportunities to explore and learn in nature/wilderness settings. At-risk and urban youth can benefit greatly from outdoor learning experiences provided by wilderness programs such as Outward Bound, as well as farm-based camps or programs like those offered by the Center for Land-Based Learning. If you know of other useful resources related to environmental education, please share your suggestions in the Comments section below. new opportunities for on-site, hands-on environmental learning. Whether you’re a teacher, parent, student, school administrator, or building professional, you may be interested in learning more about green schools. Here is a listing of many of the key websites, organizations, guidelines, and initiatives related to green schools, with a focus on school buildings/facilities (design of new buildings, retrofitting existing buildings, as well as the daily operations and maintenance of the buildings). Most of these resources are related to K-12 schools, but some of the information also applies to higher education facilities. For information on getting financing for green / energy efficiency projects, check out these sites: the National Education Foundation/ U.S. Department of Education’s Qualified School Construction Bonds, the California Energy Commission’s Energy Efficiency loans, PG&E’s School Resource Program (for schools within the PG&E utility area), and the DSIRE Database of State Incentives for Renewables and Efficiency. For additional links related to funding for green projects, see my post on Green Tax Credits, Rebates, and Other Financial Incentives.